Peeling an apple with a knife isn't much of a hassle if you're peeling one or two for your own consumption. But what if you need to peel dozens of apples? It could take you hours to get the job done. The employees of this restaurant got really tired of peeling apples with knives so they improvised. 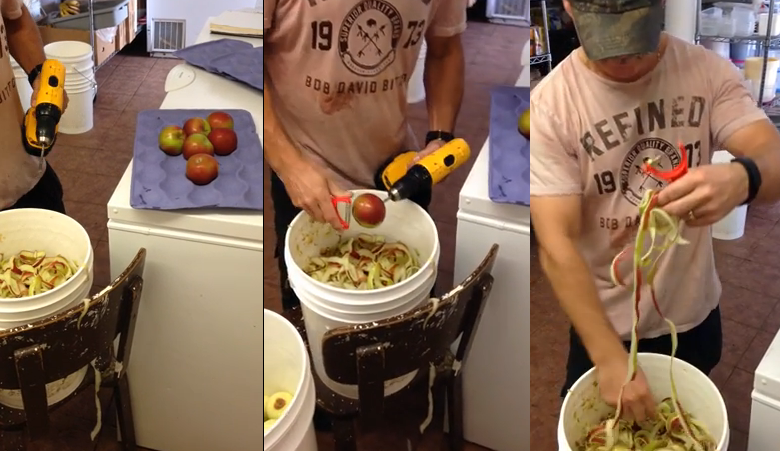 With a peeler and a power drill, buckets of apples can be peeled in mere minutes. The man below demonstrates exactly how the peeling process is done. It's like using a peeler, only this time it's 100 times faster with the help of the power drill. Six apples in under a minute? Not bad at all. The employees of this restaurant aren't the first ones to make use of this trick. A few months ago, a Dutch chef named Jasper van Ramshorst momentarily went famous online when a video of him peeling apples with a power drill went viral. You should be extra careful though should you attempt to try this at home. Clearly, the man in the video works in a restaurant so he has probably done this hundreds of times. If you are going to try it, it's highly recommended that you make use of a drill very similar to the one featured in the video. It's small and lightweight so it can be easily handled using just a single hand.